Why use synthetic air compressor oil? What is synthetic oil? Everyone knows the answer... it’s an artificial oil! Well; right and wrong. Today we’re going to try and shed some more light on what is synthetic oil. Do you monitor the oil temp of your stationary air compressor? Ever notice that the oil runs hot? 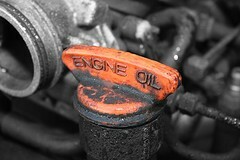 Are you spending more on oil-changes because of oil deterioration? Well you could save on oil changes and extend equipment life by switching to synthetic air compressor oil. Following on from last weeks article we’re going to look at industrial energy savings using Synthetic lubricants. Not only can companies extend their machine investments by applying energy-reducing lubricants that decrease wear and help mitigate the need of full-out replacement, but the long term industrial energy savings using Synthetic lubricants are significant . In adopting an aggressive approach to reducing industrial power consumption in industrial systems, it is necessary to implement a strategy that extends equipment performance, reduces heat and minimizes frictional losses.